How can customers vent about company service? Customers have taken to social media to vent their anger on poor customer service. The main way customers usually did this was by going on to the companies social media sites like Facebook and post on it. Due to Twitter’s character limit, you could be redirected to another channel. The problem with this is that business controls the information on these sites. Big companies use Public Relations to manage the negative impact on these channels. Most of these businesses weren’t resolving issues, they just moved it out of sight. In Australia, the game is changing. There is a new complaint platform. Business can suffer if they fail to take action or suffer public shame. The most vented industries at this stage are banking, insurance, telcos and utility companies. What’s the site called? Anthony Mittelmark, the founder, says uVent is a site where the marketplace works together to resolve the customer issue or provide an alternative. Here’s how it works. Some companies publicly announced that customers should go through the traditional channels. This has driven customers to uVent, they want their issues resolved immediately. Companies should embrace this. Improving customer satisfaction is the nature of doing business. This is how you build your business. Businesses are given a golden opportunity to steal their rivals customers. There are several things I would like to see added to uVent. 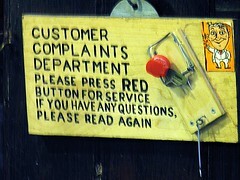 I would like to see customers and businesses able to load their complaints on social media accounts e.g. Facebook. It would be great if the uVent complaint was like a floating banner or part of the sidebar on their site that listed the shamed company. This would force the business to improve customer service and not give lip service. Adding figures like resolved, unresolved and total complaints would be great. Even better if the site went global. As a customer, would you like to use uVent? Would you like to see it go global? What other industries could be added? Should Government organisations be added? ‹ Choosing a Social Network for the business. I like this idea – I’m curious how you see it working… definitely something we could adopt. We are also deepening our social integration… if you vent with a Facebook account, this is immediately promoted as an action – and so are resolutions and churns. We like to reward also. Twitter integration is tightening up as we plan on hosting twitter feeds, and mentioning companies with a shortened url on a vent feed. Ultimately, we’re about trying to get resolutions, whether it be via good old fashioned customer service, or whether it be via competitors using it as an aquisition channel. Hey Peter, Thanks for updating me on what is happening with uVent. Sorry it’s taken so long to get back to you. Over three months is way too long. Please accept my apology. Peter, there are several solutions to the floating banner or part of the side bar on the site. I know it’s possible to have it as a floating banner or part of the side bar. The complaint can be designed similar to an advertisement but with the customers complaint and the company mentioned on this advertisement. The trick is to get that individuals name to appear on their own site and the company they’re complaining about e.g. AGL. The drawback is the cost of advertising this. There is also another solution that I have been toying around with and I know that it can be done. The solution is a widget. I won’t write it down at this stage as it’s still rough. I’ll eventually put it on this comment. I will send you a private email about this concept. Similar to what we’re thinking – a 300×250 mrec or a 300×600 double. Details about the vent, and the resolution – we’re practical. Also looking at mrecs that display the customers uVent rating realtime. As you said – the trick is to get the companies involved. Where companies sign up with uVent though, we host the widgets that you refer to that represent these. We can skin them or design them in the companies colours – and they can be hosted via ad-servers where relevant as an advertising option in and by itself. Just a note too – we’ve added federal, state, and local governments to uVent most recently – ideal with the possibility of an election – to draw focus on policies and problems.